1. 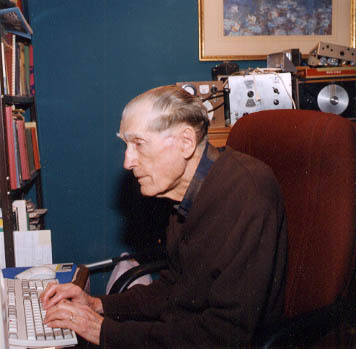 William Grover Pierpont, co-editor of The Greek New Testament: Byzantine Textform, died in Wichita, Kansas, at age 88, following a lengthy bout with cancer. He is survived by his widow, a daughter, and a brother. Addendum: He was survived by his widow for just under six months; she also has passed on as of 10 August 2003 - mar. 2. William was the son of Grover and Helen Pierpont. He was born in Wichita in 1915. His father originally was from West Virginia, but he served for 25 years in Wichita as a prominent state district court jurist, known for never having had a judgment reversed in a criminal case. His mother had graduated as a music major from Washburn College, Topeka, Kansas. 3. In high school, William Pierpont was deeply interested in math, chemistry, and physics, as well as Latin, German, and Spanish. Although he attended Friends University in Wichita for two years, he had to withdraw due to medical problems. These were so severe that doctors had suggested he might not live beyond age 30; yet, as his brother notes, "with his 88th birthday just recently, his many years of active life are a testimony that our Lord had other plans." After that time, William Pierpont was mostly self-taught. He learned ancient, biblical, and modern Greek from his father's old textbooks (his law-trained father had mastered Greek as an undergraduate). William also learned Biblical and Rabbinic Hebrew and Aramaic from a local Rabbi. As time passed, he extended his language acquisition expertise to include many European and Asiatic languages. Because of his language skills, at various times he served as an interpreter for foreign visitors to Wichita. 4. As a hobbyist, he was an early pioneer in wireless ham radio (mostly Morse code). He was licensed in 1930 at age 15 as W9BLK and W9HPU Portable, although he actually had begun radio experimentation several years prior. In 1932 he served as a primary ham communicator with the Byrd Antarctic Expedition and was commended by Franklin Roosevelt for his work in this area. Although he had allowed his license to lapse after World War II (during which all hams were suspended), in 1986 he reactivated his license, obtaining the call sign N0HFF. During that time, he authored a training manual for aspiring hams, The Art and Skill of Radio-Telegraphy, now in the 6th printing of its 3rd edition. This book has been acclaimed worldwide as what his brother accurately terms "the finest and most comprehensive treatise ever written on Morse code, its history, and its use." It has been translated into various languages; is published in English, French, and Japanese; and is also available for free download from various internet sites. As an illustration of his code and language skills during his retirement years, his brother mentions an ability to interpret and translate Morse Code in the Polish language as it emanated from two separate stations at 35 words per minute. His last Morse code transmission before health problems intervened was to his brother on 7 February 2002. 5. William was married to Enid Feese on 11 March 1939 and was then employed in the Federal Land Bank of Wichita. Around 1940 he began work at Beech Aircraft as a Weight Analyst in their Weights and Balance department, and shortly thereafter he began self-study of technical works regarding aircraft structure, dynamics, and vibration. This was possible because of a special innate ability to read and absorb highly technical theoretical and mathematical material in a rapid manner. He was soon raised to the status of Engineer in the Structures department, where his technical expertise allowed him to create and head a Structural Dynamics Group. He eventually became recognized--even within NASA--as an expert in aircraft structural dynamics, particularly vibration and wing flutter. He often served as an expert witness regarding the causes of small plane crashes. He retired as Chief Scientist at Beech in 1982 after approximately 41 years of service. 6. William was raised in a Christian home, with a Baptist denominational background. The family had belonged to an unaffiliated Baptist church in downtown Wichita that in 1932 affiliated with the Southern Baptist Convention. Over the years, his local church affiliation changed several times, involving several Baptist congregations, as well as the Christian Church. During the 1970s, he and his wife became permanent members of the Evangelical Free Church. William and Enid remained active Sunday School and Bible Fellowship teachers within their various local church affiliations. William and Enid had three children, of whom one daughter is still living. 7. William Pierpont began his Greek New Testament study in 1933 while a freshman at Friends University. He was taught from the Westcott-Hort text by Professor J. H. Langenwalter, and at that time he fully accepted the general theory and underlying principles of that edition. From that point, he became an ardent student of New Testament Greek for the remainder of his life, and his curiosity and interest regarding the theory, principles, and methodology of New Testament textual criticism began to develop. He devoted thousands of hours of reading and study to this particular field, even while favoring the Westcott-Hort type of critical text and gravitating toward a reasoned eclectic methodology of text-critical praxis. 8. In the mid-1960s his views regarding textual criticism begin to change. After exploring many issues regarding the underlying theory and praxis of modern eclectic methodology and its resultant critical text, he began to examine the entire matter more deeply. As a result of this intense inquiry, he began to abandon certain aspects of the theory and operative principles under which he had functioned during the previous thirty years. His shift in text-critical opinion derived primarily from this independent questioning and detailed analysis of individual variant units. Only later did he become acquainted with those 19th and 20th century writers who had questioned various aspects of the Westcott-Hort theory or the current eclectic critical text. 9. In his quest for knowledge he obtained and carefully studied various works covering many aspects of New Testament textual criticism. He was as familiar with Tregelles, Alford, Westcott and Hort, Vincent, Nestle, Gregory, Souter, Kenyon, Metzger, and Colwell as he was with Scrivener, Burgon, Miller, Cook, Salmon, Whitney, and Hoskier, along with many other writers in the field. He carefully sifted all materials, retaining what was helpful while questioning anything that was weakly-supported, polemical, circular, or anti-intellectual, including various special pleadings urged in behalf of particular printed editions and translations. 10. Pierpont's intention was always to inquire fully into the leading aspects of text-critical theory and to investigate all textual units of variation. His method of research did not anticipate any acceptance or promotion of the Byzantine Textform as a whole., although he was led to accept many Byzantine readings as superior to that which had appeared in various critical editions. In that era, the Nestle-Aland 25th edition and the UBS 1st edition were in common use, and the UBS edition in particular presented a substantial array of evidence regarding the variant units considered significant for translators. Pierpont prepared extensive personal notes regarding these variant units, and he detailed his rationale for any departures from the modern critical text. The formation of these notes began his movement toward what would become the "Byzantine-priority" position, even though at this time he had not entered into a specific examination of the Byzantine Textform itself. 11. During this mid-1960s era, Pierpont purchased a microfilm of von Soden's 4-volume Prolegomena and Text (replaced during the 1970s by the last available copy of the printed edition from the original publishers). He carefully examined von Soden's discussion and presentation of evidence and meticulously worked through all variant units cited in that edition. Each variant was categorized and analyzed on the basis of external and internal evidence within Pierpont's then-current reasoned eclectic framework. As his eclectic decisions began to demonstrate a preference for a large number of Byzantine readings, he became involved in a decade-long inquiry regarding the entire concept of New Testament Greek manuscript transmission, along with various aspect of text-critical theory and praxis, in the hope of understanding and explaining the observed phenomena. 12. By 1975, William Pierpont had thoroughly researched all these factors and had prepared an outline of a plausible underlying theory of transmission that could explain the textual variations and text-type alignments of the existing documents. This theory suggested that a single text-type (or "Textform") would be more likely to reflect the autograph text than the various eclectic or documentary alternatives. As part of this process, Pierpont was able to evaluate and establish the basic pattern of readings which are considered to comprise the Byzantine Textform. He also examined the various transmissional factors that might account for the rise and relative dominance of the various remaining text-types and subtypes according to their particular textual patterns and levels of agreement. Such was the unplanned beginning of what became the theory and praxis now known as the Byzantine-priority hypothesis. 13. In 1976 Maurice Robinson become a research partner with William Pierpont as the unplanned result of a letter written by Pierpont to a Bible publisher; that letter of inquiry regarding certain aspects of New Testament textual criticism was passed for reply to Robinson. This initial contact occurred providentially at the most appropriate time, since Robinson and Pierpont were each beginning an independent detailed study of Hoskier's massive collation data in his Concerning the Text of the Apocalypse in an attempt to discern the various alignments and degrees of support among the textually-divided Byzantine manuscripts of that New Testament book. This initial contact developed into a joint partnership, friendship, and association that extended for more than a quarter-century (1976-2003), from which results still continue to issue. 14. Pierpont and Robinson thus began an extensive series of correspondence by regular postal mail (in the days before computers). In the process they discussed various aspects of theological and textual concern and gave particular attention to the question of the form of the Greek text that might best represent the autograph form of the canonical New Testament scriptures. 15. Pierpont's initial set of privately typed notes--developed prior to Robinson's association with him--were organized more formally as part of their joint reexamination of the data. The revised notes were supported by worksheets containing various internal and external comments that related the examination of variants on internal and external grounds to the underlying transmissional theory regarding the basic text. Thus began the formal development of the "Byzantine-priority theory" of New Testament textual criticism. 16. As a result of the joint correspondence between Pierpont and Robinson, every text-critical decision was rechecked and reevaluated; thus, the privately-circulated notes steadily were refined and improved. Eventually these revised notes were published as an appendix to the New Testament volume of an Interlinear Bible in 1979 in their then-current form. The research and evaluation continued to progress from that point, however, and subsequent improvements regarding theory and praxis continued to be made by the joint editors. 17. With the advent of office computer technology in the 1980s, the original notes were converted into a complete electronic Greek New Testament text. By 1986, this running Byzantine text had become available as a module in the Online Bible computer program. In 1991, the printed edition of The Greek New Testament according to the Byzantine/Majority Textform was published (copies of that edition are no longer obtainable). The electronic form of the Robinson-Pierpont Greek New Testament is openly available in many software packages, including programs such as the Online Bible, BibleWorks, Sword, OliveTree, and Logos; its electronic text remains freely downloadable in ASCII form at numerous internet sites worldwide. A revised edition of the Robinson-Pierpont Byzantine Greek New Testament is currently in preparation and should become available in printed and electronic form sometime during 2003. Even during his last months, William Pierpont continued to work with interest on this forthcoming new edition; his last written communication with Robinson occurred about a month before his death. 18. One can only guess as to how many people may be familiar with the Byzantine Textform Greek New Testament that resulted from William Pierpont's initial typewritten notes prepared so many years ago. His name has become familiar to many, and we all owe him sincere thanks for his labor of love regarding the word of God and his selfless service to his Lord and Savior Jesus Christ. 19. The 2003 edition of the Byzantine Greek New Testament will be a fitting memorial to the spiritual life and work of William G. Pierpont. In all aspects of this text and edition, William Pierpont's contribution remains primary--the order of the editors' names (Robinson-Pierpont) was that chosen by Pierpont, arranged more for euphony than for any other factor. Over 95% of the Byzantine Textform edition remains that which Pierpont had initially prepared in note form, long before Robinson's association with him. The Byzantine Textform Greek New Testament abides as William Pierpont's tangible legacy, prepared by a committed, loving, and sincere Christian gentleman, to whom all owe a debt of thanks. © TC: A Journal of Biblical Textual Criticism, 2003. The original version of the obituary without the Addendum in par. 1 is also available (ed. ).